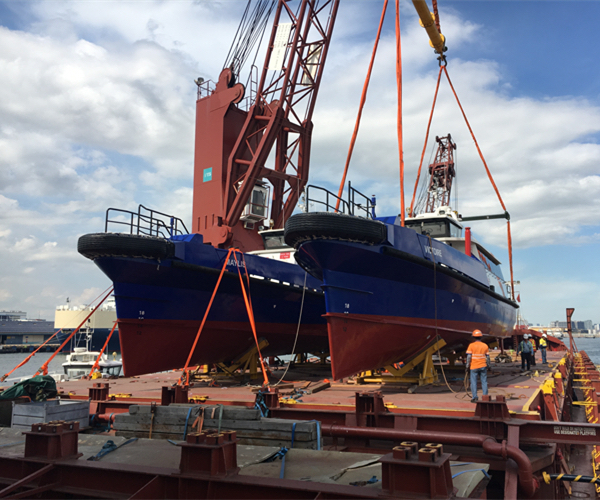 The operation involved receiving six crew boats, 22-meter long, less than 6-meter wide and 9-meter high, from Ex Works a shipyard in Singapore, to the specially chartered heavy lift vessel. Each crew boat had to be transported on their cradle, with a total weight of 45 tons. The main challenge for Bolloré Logistics Singapore was to meet the very short deadlines for the preparation of operations and the coordination between the various stakeholders. As the boats could not be “self-navigated” in Singapore waters and could not be wet-towed by local tugs from the shipyard to the chartered vessel, Bolloré Logistics Singapore had to mobilize the barges which allowed a load out in a very narrow location. Although the preparation took place very shortly before loading, Bolloré Logistics Singapore was able to quickly mobilize its teams of specialists. They have come up with a large number of innovative solutions which were then offered to the customer. Once the plans were fixed and agreed, the entire operation was smooth and the vessels were loaded without delay or Lost Time Injury (LTI).